Rossdorf, Germany: – Water treatment specialist EnviroChemie is bringing its high technology ‘Made in Germany’ systems and services closer to new customers in the Middle East, with the establishment of an office in the Gulf emirate of Dubai. 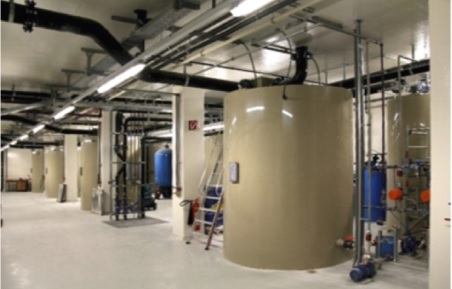 The new bureau will handle the sales and servicing needs of its water technology plants. EnviroChemie has also expanded its European sales and servicing network in Europe with the opening of a new office in Austria. The new Dubai office will cover the entire Middle East region. The main focus of the office is to provide consultancy, customer service and to sell “Made in Germany” process water and wastewater treatment plants. These include customized and modular Envochem plants for physico-chemical treatment, the Biomar series for biological treatment, Flomar flotation plants and Envopur membrane plants. “Our technologies have already been well established locally with plenty of enthusiastic customers,” said Robin Steinsdorfer, EnviroChemie’s country manager for the Middle East. In Villach, Austria, the new office will cover EnviroChemie’s entire product range. “Our aim is to provide advice and to sell complete system solutions for plant engineering, customer services and treatment agents to industry and trade,” explained Dr. Gerd Sagawe, Head of Strategic Business Development at EnviroChemie. Both new offices will focus on supporting EnviroChemie’s proprietary processes and solutions for the treatment of water and wastewater from pharmaceutical production sites, including turnkey plants, water chemicals treatments for all water types of process water, recycling, zero-liquid-discharge, cooling water, and wastewater treatments. They will aim to present solutions that integrate science, engineering and expert consultancy to develop water treatment solutions closely tailored to respective customer requirements. EnviroChemie products are developed and supplied from three sites in Germany and Switzerland and the company operates seven sales and service offices, including subsidiaries in Brazil and Russia. Click on EnviroChemie expands sales network to Middle East for other information.